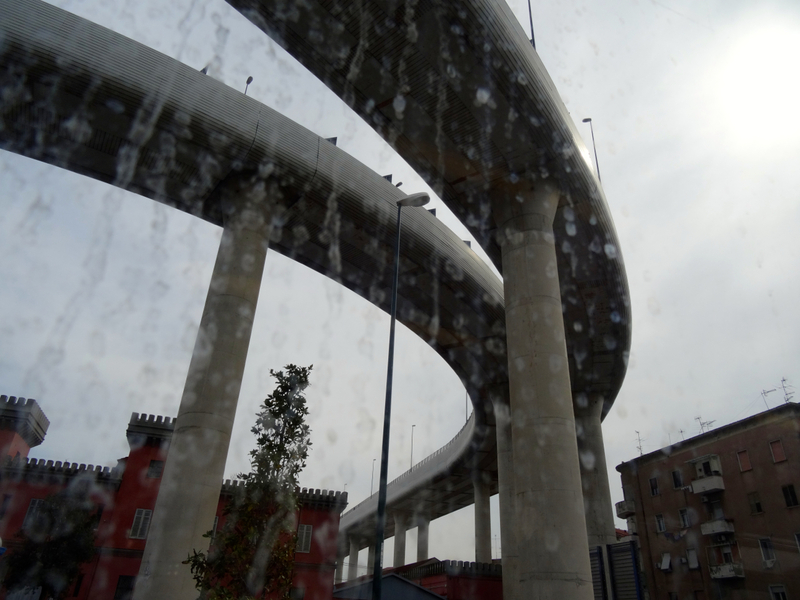 I came into Naples by bus from the airport – down the hill, under the silent roads and on to the train station. The rest of the day was spent on foot. 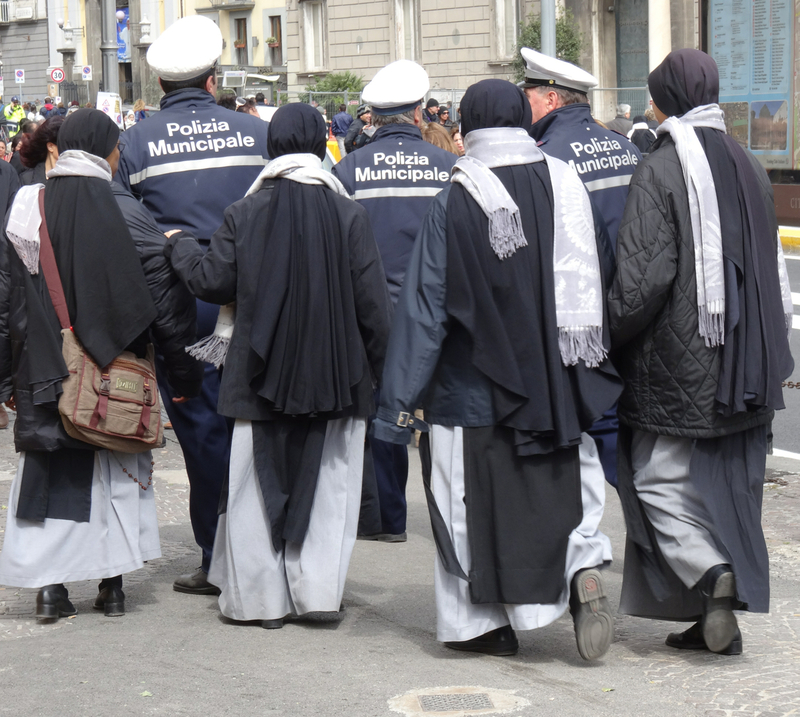 The Pope’s route was easy to spot – it was clearly marked and police and voluntary organisations were everywhere – from the polished, to the fluorescent, to the plain-clothed. The surveillance was individual and penetrating. I glimpsed the Pope twice. Once he was en route from Piazza di Plebiscito to lunch with inmates in Poggioreale, and the second time he was heading from the prison to the city’s cathedral. Both times I chose to wait on corners and each time I waited the crowds grew. It was eerily quiet – no traffic, only endless eyes watching and waiting, and the cries of the flag sellers determined to shift their stock. 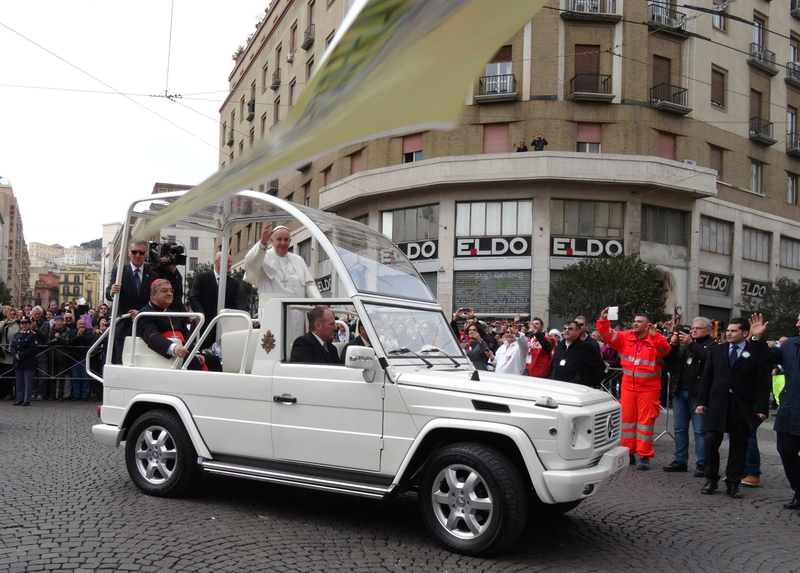 Eventually the popemobile did come at quite a pace over the cobbles, slowing slightly to round the corners and every time the Pope was on his feet with one hand to balance and the other to bless. 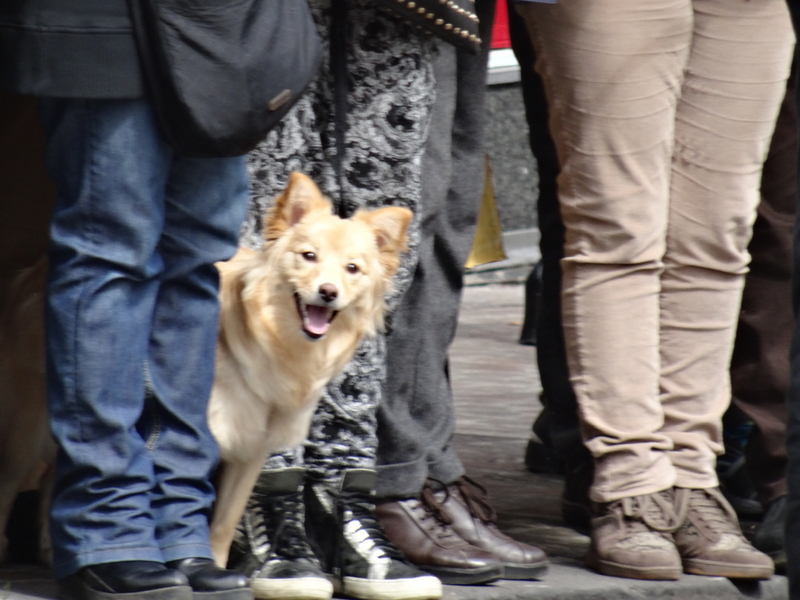 He was in sight only a very few seconds but it was if an electric jolt went through the quiet crowds – an irresistible explosion of cameras, of smiles, of delight. 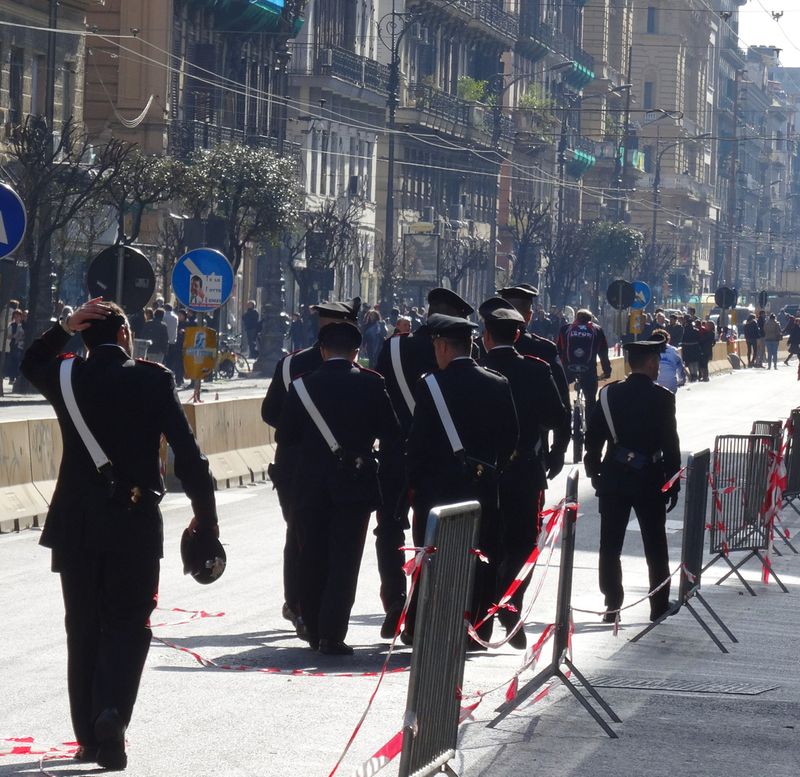 From my first corner I went to see the Piazza di Plebiscito where the Pope had spoken in the morning. I walked against the tide. 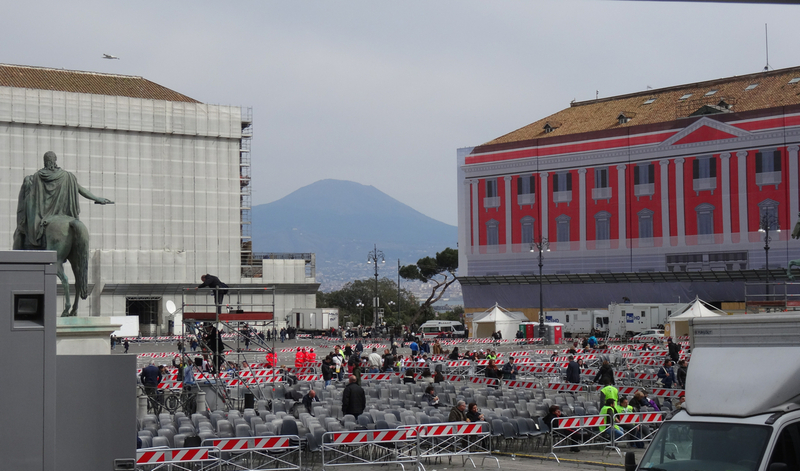 I climbed the steps of the Basilica di San Francesco di Paola to get a view over the stage where the Pope would have sat and I found Vesuvius looking straight back at me. By this point I felt weary and crowd-tired. I didn’t like to think what the Pope, age 78, felt. His day had begun with a helicopter ride from the Vatican at 7.15am. As I stood in the quiet Piazza di Plebiscito he was already at lunch with inmates at Poggioreale. I saw the Pope again from another corner when he was on his way back from the prison to the Duomo where the dried blood of San Gennaro is stored. 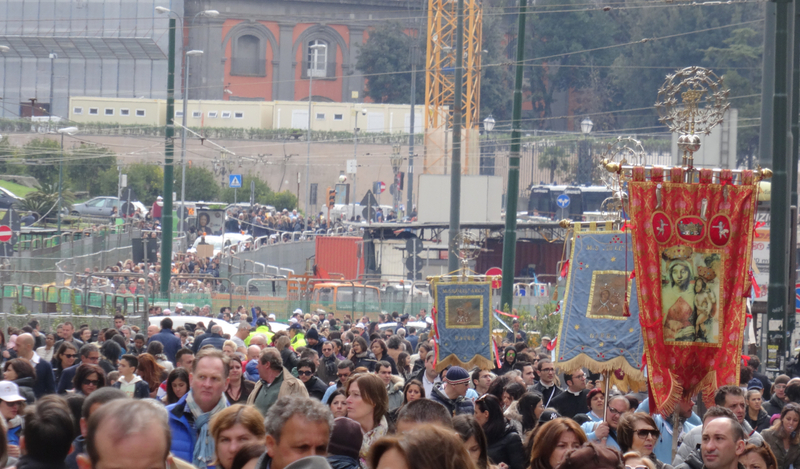 It’s said that the blood started to liquefy in the Pope’s presence – a moment of great significance to many in Naples. I watched the last of the Pope’s visit on the television. He was on the Lungomare, back to the sea with battleships behind, and began his talk there with an apology: “sono veramente stanco” (I am truly tired). Unscripted he spoke with thoughtfulness, humour, real understanding and no speck of pomposity. Then, finally, he was allowed to take the helicopter home. It was a long day for many, but a day that had seen Naples allow a pope to shine a public spotlight into its most uncomfortable places. – that evil should be resisted. – that Naples, with its great capacity for love, ‘tanta capacità di amare‘, should find the strength to go forward with hope – ‘la forza di andare avanti con speranza‘. 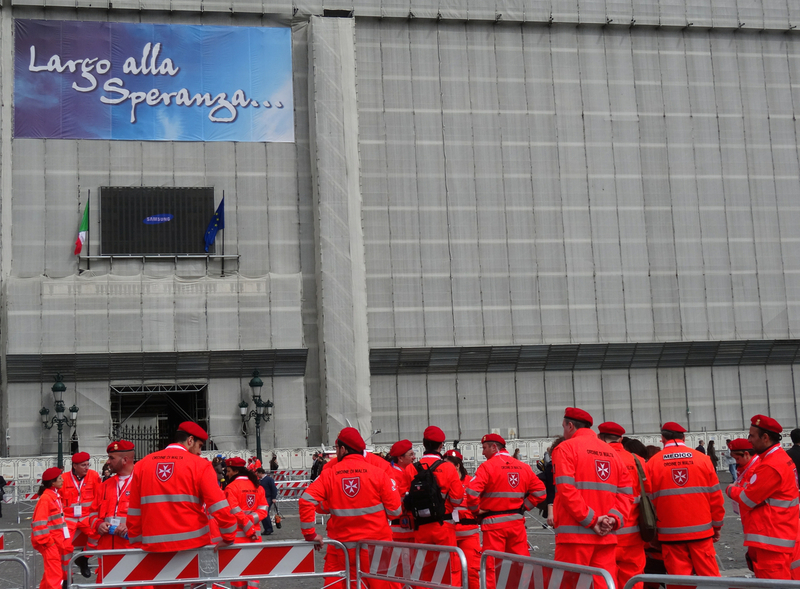 But, perhaps what Naples remembers with most warmth, is that Papa Francesco addressed them in Napoletano. This entry was posted in Italy, Naples, Other discoveries in Naples, People and tagged Acerra, Largo alla Speranza, Naples, Papa Francesco, Piazza di Plebiscito, Poggioreale Prison, Pope, Scampia. Bookmark the permalink. Beautiful! I “wordpressed” it to my blog. Thanks so much! Glad you found it. It sounds like a spiritual as well as a physical experience. Hello Liz – I’m not sure which word best describes the experience. I walked miles through the city with its quiet streets so it definitely was a physical experience but there was something else, something about witnessing this one man, critic of corruption and violence, come to Naples, speak his mind and yet convey hope, warmth and a sense of respect. It was an unusual gift for the city and perhaps you’re right, a spiritual experience for me. The sort of day that doesn’t happen very often … a little like the eclipse!